I first encountered Jay Rummel in the mid 1980’s. He would come into the Tropicana Cafe on Woody Street and play guitar and sing for a free breakfast and tips. I was the dishwasher there and was unimpressed.He was out of tune and obviously drunk. I asked the owner why she let him play there. She immediately lashed out at me “Jay can play here anytime he wants” and stomped off, leaving me to my pearl diving. I soon found out the why of two things. Turns out he was responsible for all the legendary black and white wood block print’s that were ubiquitous, in all the right places about town, and he was drunk and hungry at noon because he’d been up all night working on his art. Live and learn I guess. Later on, after I bought into Circle Square, he was somewhat of a regular, being the store was right between his old studio on Woody Street and his favorite watering hole, Charlie B’s on Higgins Ave. He would get the occasional small loan on unused instruments (I still have his Hawaiian Steel), and besides he collected comic books, (especially Tijuana Bibles) of which we had ample supply. I think I sold him a few pairs of cowboy boots as well. 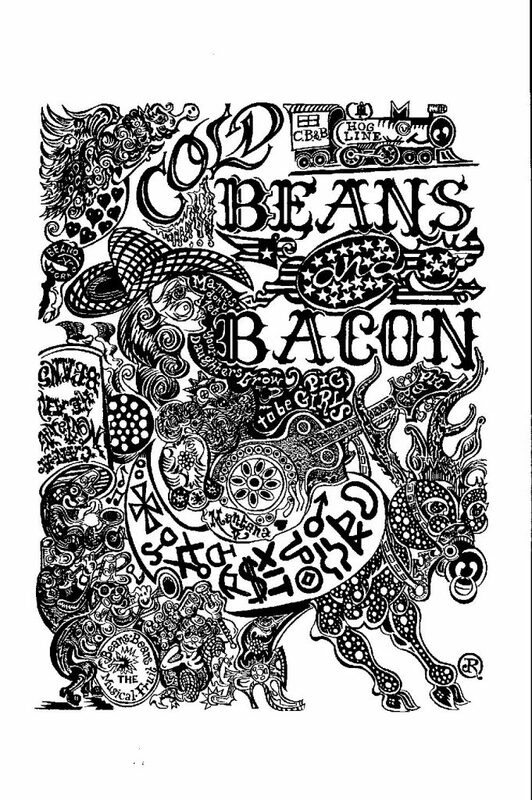 Eventually, my old band ‘Cold Beans n Bacon’ became the “House Band” at Charlie B’s. Jay was a regular at these gigs, frequently seen Two Stepping with the ladies during the first country tinged set before the bar dissolved into Chaos later in the evening. Eventually, (1995) we made a record (a CD really) but I won’t go into that. Let’s just say it wasn’t what any of us had hoped for, but that’s a whole different tale. There were two good things about the CD though. It made it a lot easier to get gigs, and the cover art provided by Jay and Barb Tellin. When the disc came out we invited The Missoulian and The Missoula Independent to review, or at least announce the project. The Missoulian immediately buried a short paragraph in the sports section. In their defense, they didn’t really do arts coverage back then. The Indy however, nothing. Notta. This was strange because the band was friends with all the owners of the paper. They came to our gigs! One month turned into six. It was approaching a year after the CD release when I got a call at Circle Square. “Hi. My name’s Jim Crumley and I’ve been hired to write a story about your band for The Missoula Independent. Would you mind if I come to all your practices and gigs for the next month”? Not at all, kind sir. Not at all. I have to admit I had no idea who he was, but I was about to find out that he was a lot of fun, and that he was as much of a local legend as Jay. He had written a bunch of very entertaining crime novels (mostly popular in France) and had taught literature at The U of M for years. When the article came out, it was pretty much a love letter to the band wrapped up as a fantasy with Crumley becoming Mayor of Missoula and CB&B being his city council, jointly returning Missoula to it’s pre-yuppification days. “Tear down the awnings!” would be our rally cry! The biggest surprise, though was Jay’s cover art, as seen above. We got the cover and the feature story! Thank you Missoula Independent. Ironically, it was while reading a recent copy of the Indy, featuring a story about Jay’s lasting footprint on Missoula’s art scene, where he also got the cover and the feature article, I realized this print was his last real commercial work. He just got sicker and sicker from that point. He refused to quit drinking. “You can’t get into Cowboy Heaven if you quit drinking” he once told me, and was dead a short time later. The biggest irony of all is he died in the very living room which spawned CB&B on Missoula’s West Side. Once I realized this was “The” last Rummel, I had my copy of the art blown up from magazine size to a full size print. It looks great, thanks to Marcy at ‘Paper and Ink Studios’, and I am working on getting a couple copies put up, in the right places about town, keeping the legacy alive. I hope your enjoying Cowboy Heaven Hoss.